Upon completion of shakedown and training, she departed New England coast for the Pacific theater of operations on 4 May l943. 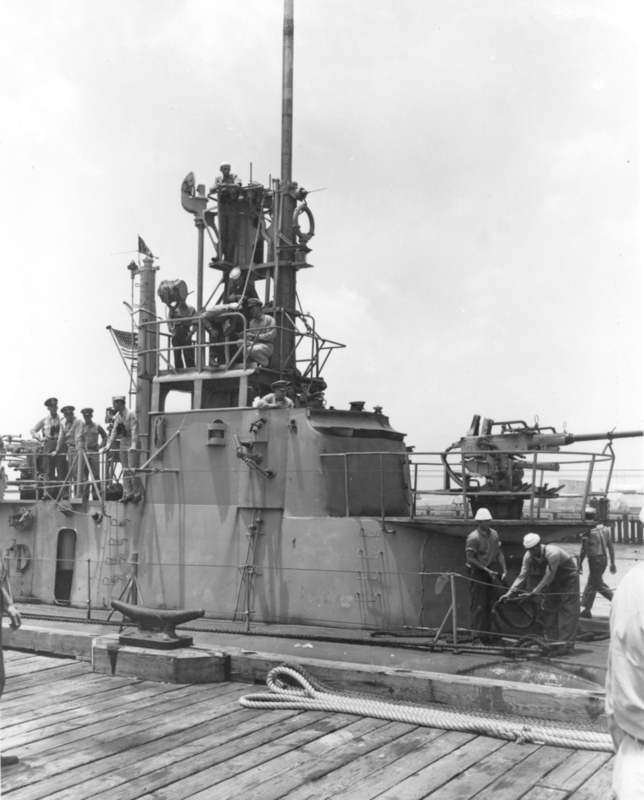 Lapon received four new engines after her seventh war patrol in early 1944 at Mare Island Naval Shipyard in Vallejo, CA, then returned to the South China Sea and completed another patrol and was preparing for her ninth patrol when hostilities in the Pacific ended. On 26 August 1945, Lapon departed Midway Island and sailed for the Gulf Coast of the United States and arrived in New Orleans, LA on 20 September 1945. After port calls in Galveston TX; Houston, TX and Staten Island, NY, she finally arrived back at Groton, CT.
Lapon ultimately decommission at Groton on 25 July 1946 and "mothballed" in the Atlantic Reserve Fleet. 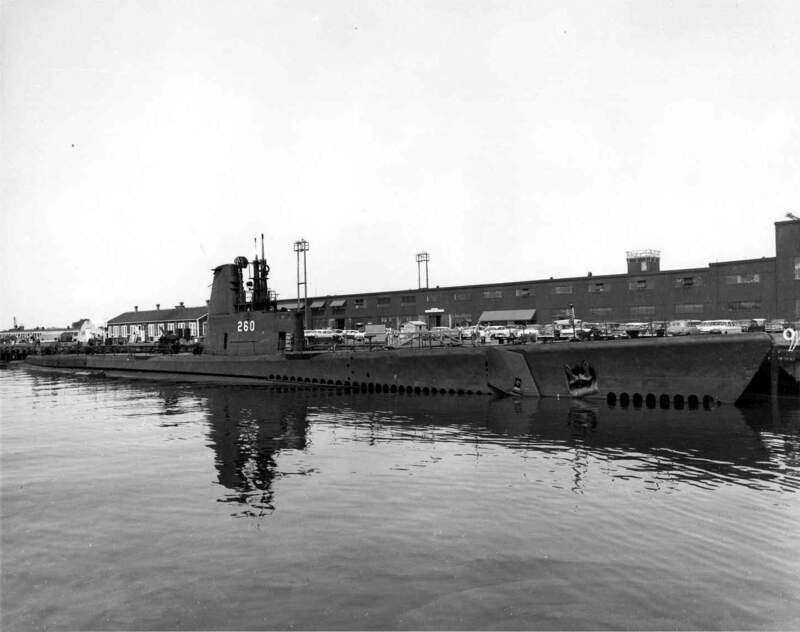 At the Portsmouth Naval Shipyard in Kittery, ME on 13 April 1957, Lapon was re-commissioned and received a snorkel and partial "Guppy" conversion. Pursuant to the Military Assistance Program, she was once again de-commissioned and transferred (loaned) to the Hellenic Republic of Greece. 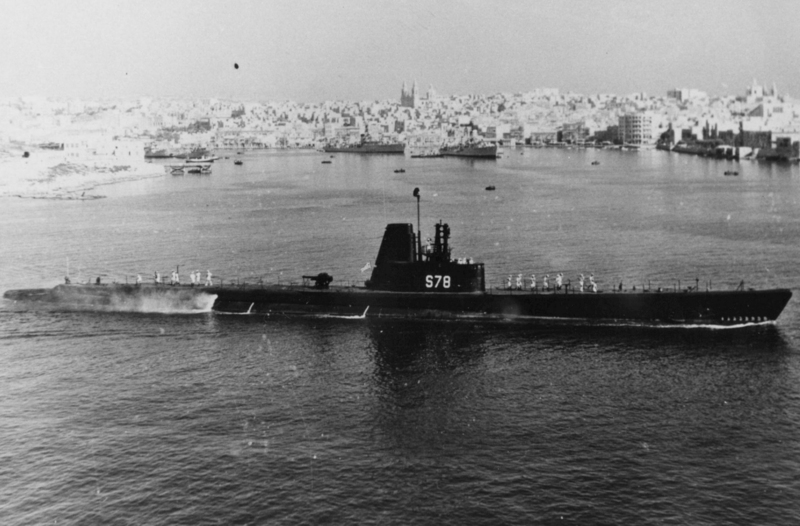 The ex-Lapon was the first United States built submarine to enter the Hellenic Navy, as well as the first Greek submarine to bear the name of the mythical "Ruler of the Seas". HS Poseidon (Y-16) was commissioned on 10 August 1957. Her name was canceled 22 March 1965 to clear the name for SSN-661, ordered in October 1963 to be built by Newport News Shipbuilding and Dry Dock Company in Newport News, VA. While in the service of the Hellenic Navy, HS Poseidon also bore the pendant number S-78. 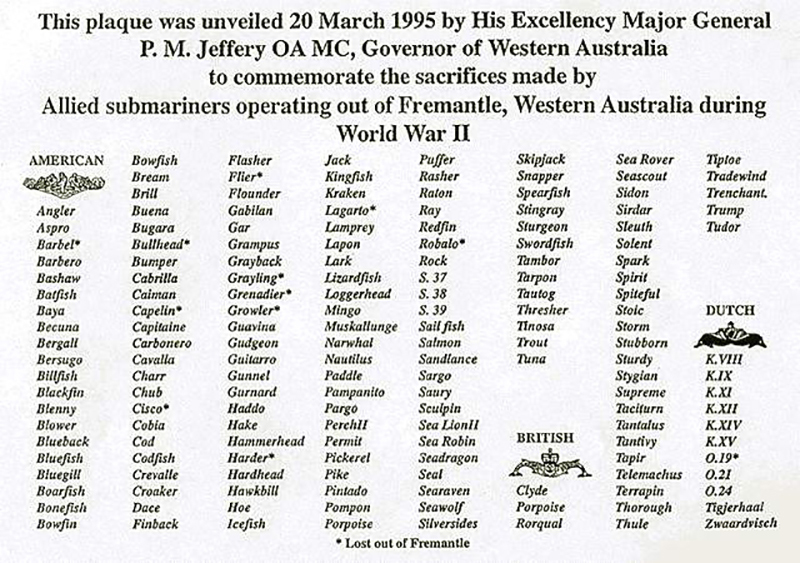 She was taken from active service as a Hellenic Ship on 11 April 1975; struck from the United States Naval Vessel Register (NVR) on 31 December 1975 and purchased by the Republic in April 1976 to be used for spare submarine parts. Final fate; sunk as target April 1976 in Agean Sea. Lapon was awarded the Navy Unit Commendation and received 4 battle stars for World War II service. Specifications: Displacement, Surfaced: 1,526 t., Submerged: 2,424 t.; Length 311' 9"; Beam 27' 3"; Draft 15' 3"; Speed, Surfaced 20.25 kts, Submerged 8.75 kts; Complement 6 Officers 54 Enlisted; Operating Depth, 300 ft; Submerged Endurance, 48 hrs at 2 kts; Patrol Endurance 75 days; Cruising Range, 11,000 miles surfaced at 10 kts; Armament, ten 21" torpedo tubes, six forward, four aft, 24 torpedoes, one 3"/50 deck gun, two .50 cal. machine guns, two .30 cal. 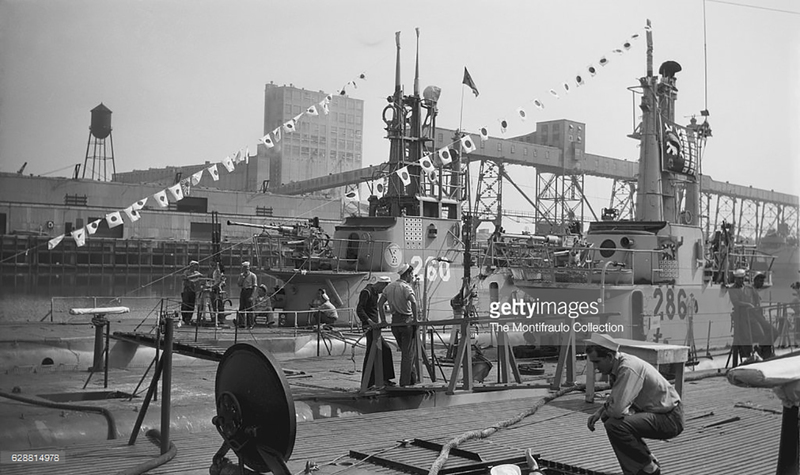 machine guns; Propulsion, diesel electric reduction gear with four Hoover, Owens, Rentschler Co. main generator diesel engines, 5,400HP, Fuel Capacity, 97,140 gal., four Allis Chalmers Manufacturing Co. main motors, 2,740HP, two 126-cell main storage batteries, twin screws. 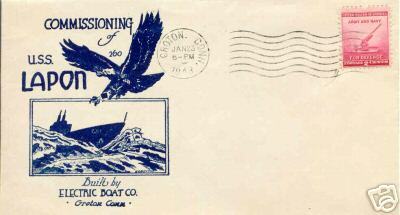 22k Commemorative post mark on the occasion of the Lapon's (SS-260) keel laying, 21 February 1942, at the Electric Boat Co., Groton, CT. Courtesy of Jack Treutle (of blessed memory). 478k Off to the war, Lapon (SS-260) slides down the launching ways at the Electric Boat Co., Groton, CT., 27 October 1942. USN photo # 80-G-40214 from NARA, College Park, Maryland, courtesy of Sean Hert. 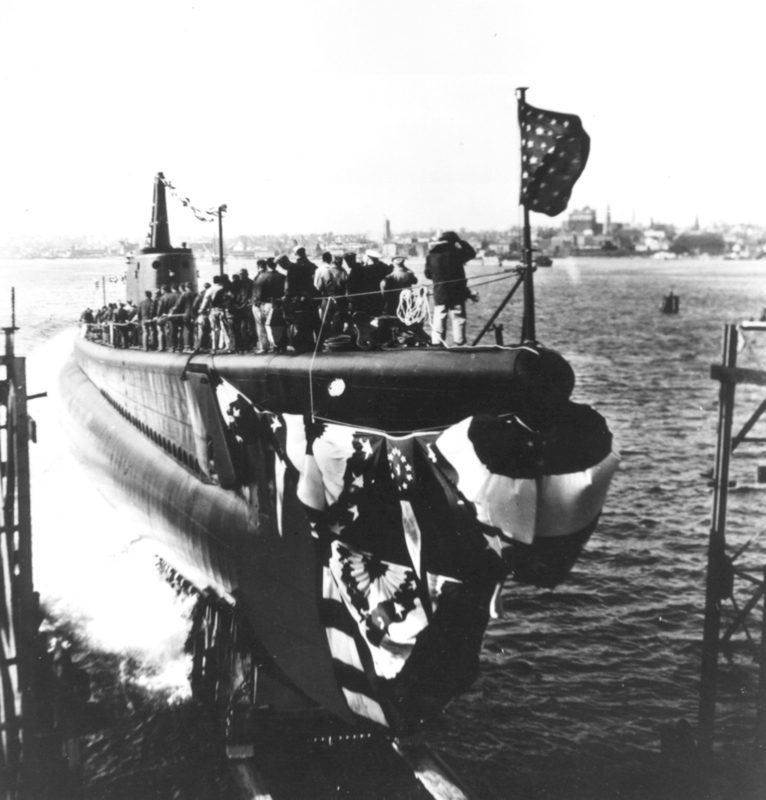 930k Waterborne at last, Lapon (SS-260) has just finished her slide from the launching ways at the Electric Boat Co., Groton, CT., 27 October 1942. The front part of the wake is just visible off her bow. Text and i.d. courtesy of John Hummel (USNR). USN photo courtesy of ussubvetsofworldwarii.org. 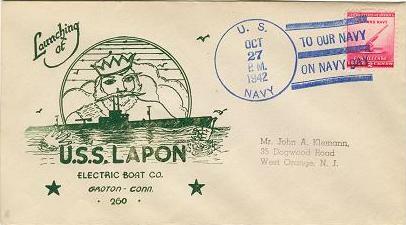 22k Commemorative post mark on the occasion of the Lapon's (SS-260) launching, 27 October 1942, at the Electric Boat Co., Groton, CT. Courtesy of Jack Treutle (of blessed memory). 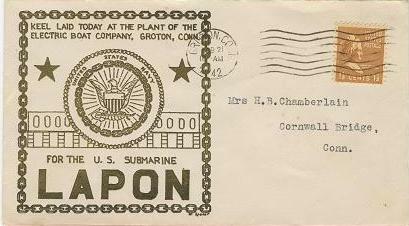 17k Commemorative post mark on the occasion of the Lapon's (SS-260) commissioning, 23 January 1943. Courtesy of Jack Treutle (of blessed memory). 719k Cmdr. Lowell T. Stone seated in the Officer's Stateroom, circa 1943. 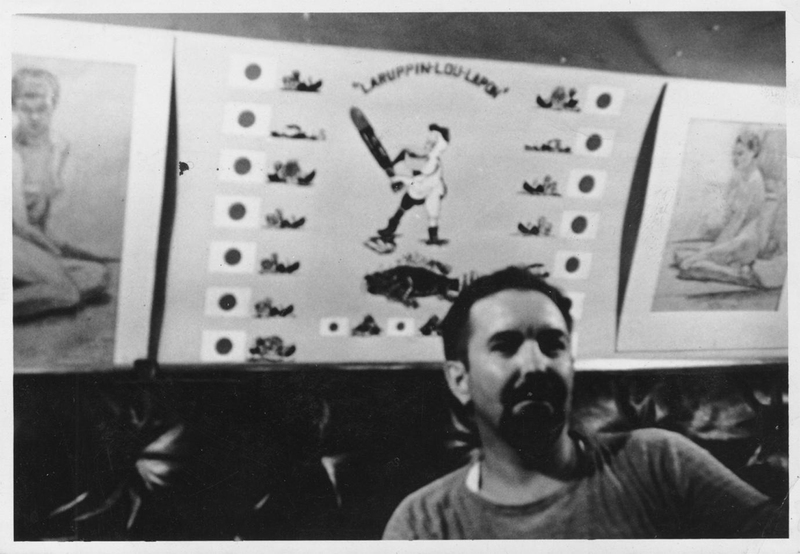 The "scorecard" and mascot, Laruppin-Lou-Lapon, and fish namesake are featured on the wall. From the personal collection of Timothy Stone, grandson of Commander L. T. Stone, Lapon (SS-260) & text via via Wikipedia & Robert Hurst. 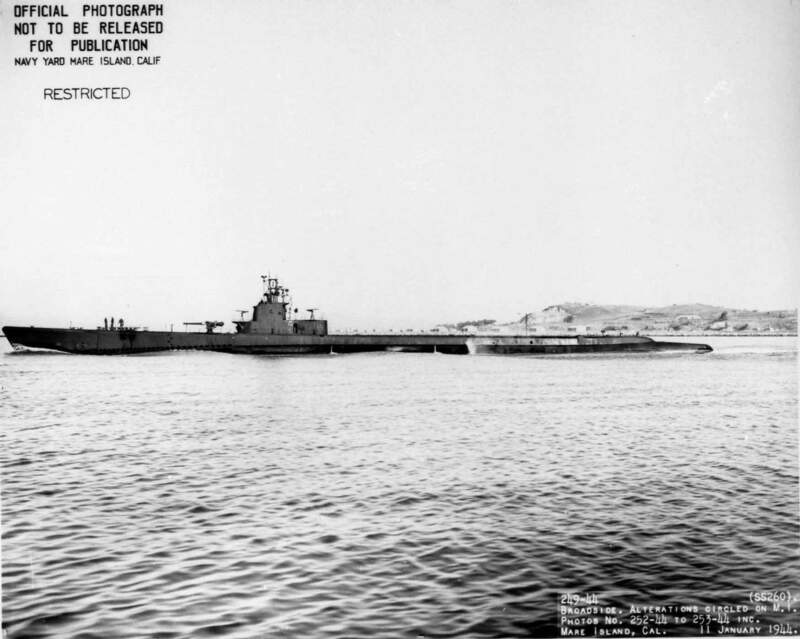 316k Lapon (SS-260) returning to port, possibly Fremantle, Australia. This was possibly the last patrol of Cmdr Stone, who can be seen in the lower right of photo. The Japanese flag flying atop the No. 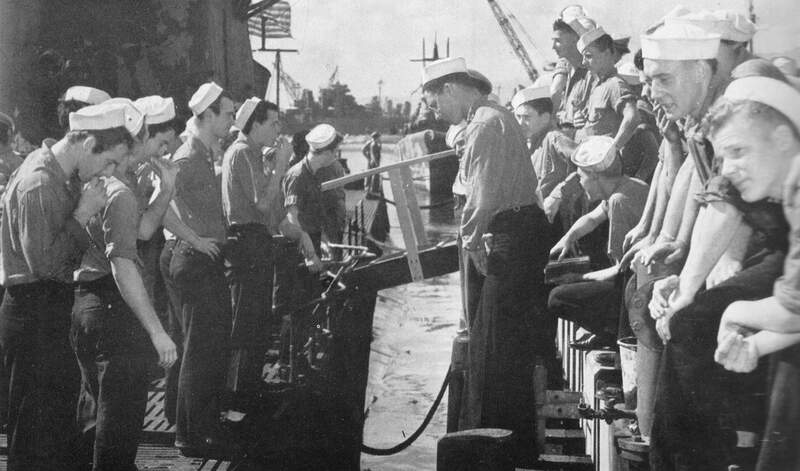 2 periscope was acquired by the crew from a Japanese civilian fisherman in exchange for provisions. Photo from the personal collection of Timothy Stone, grandson of Commander L. T. Stone, Lapon (SS-260) via Robert Hurst. 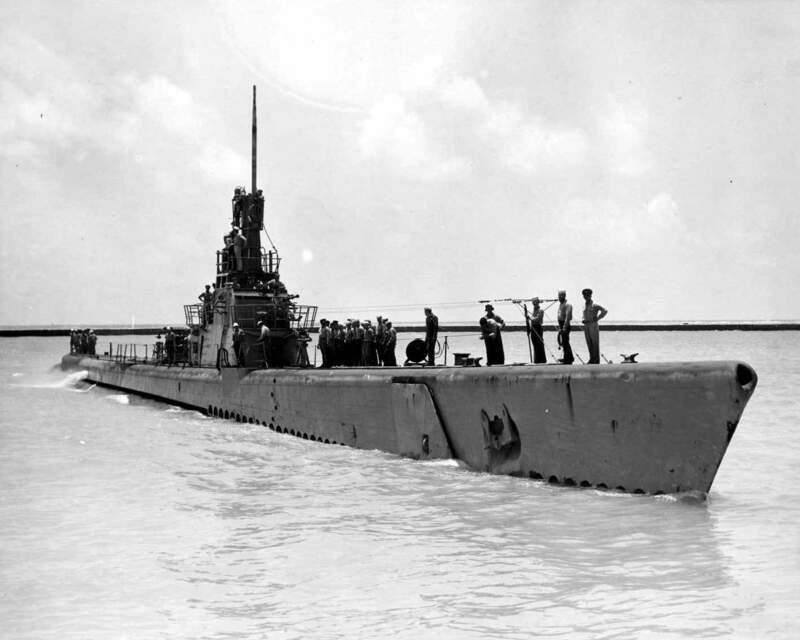 153k Lapon (SS-260) ties up to the wharf at Pearl Harbor, possibly on 22 April 1945 from her last patrol. USN photo courtesy of ussubvetsofworldwarii.org. 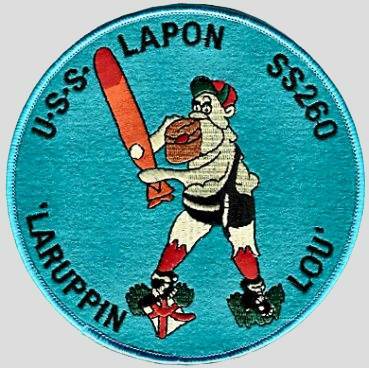 131k Lapon (SS-260) underway off the California coast following an overhaul at Mare Island CA. Navy Yard. 11 January 1944. Courtesy of John Hummel, USN (Retired). 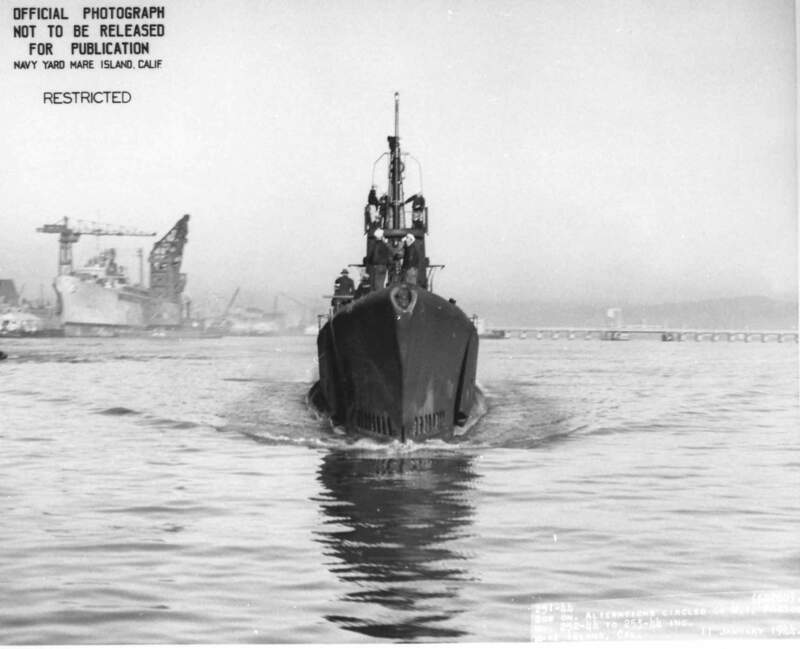 106k Stern view of the Lapon (SS-260) departing Mare Island on 11 January 1944. USN photo # 247-44, courtesy of Darryl L. Baker. 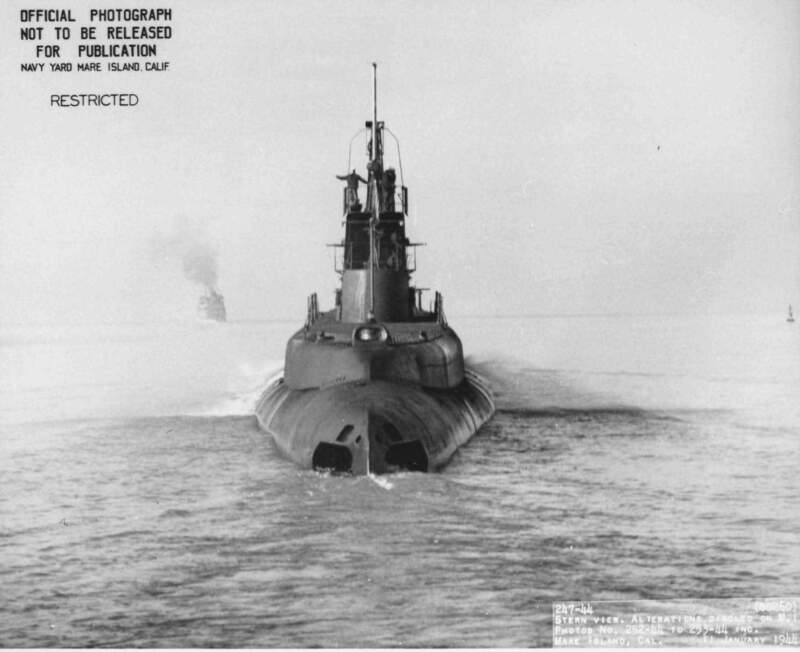 153k Port side view of the Lapon (SS-260) underway off the California coast following an overhaul at Mare Island CA. Navy Yard, 11 January 1944. She was at the yard from 13 November 1943 until 22 January 1944. USN photo # 249-44, courtesy of Darryl L. Baker. 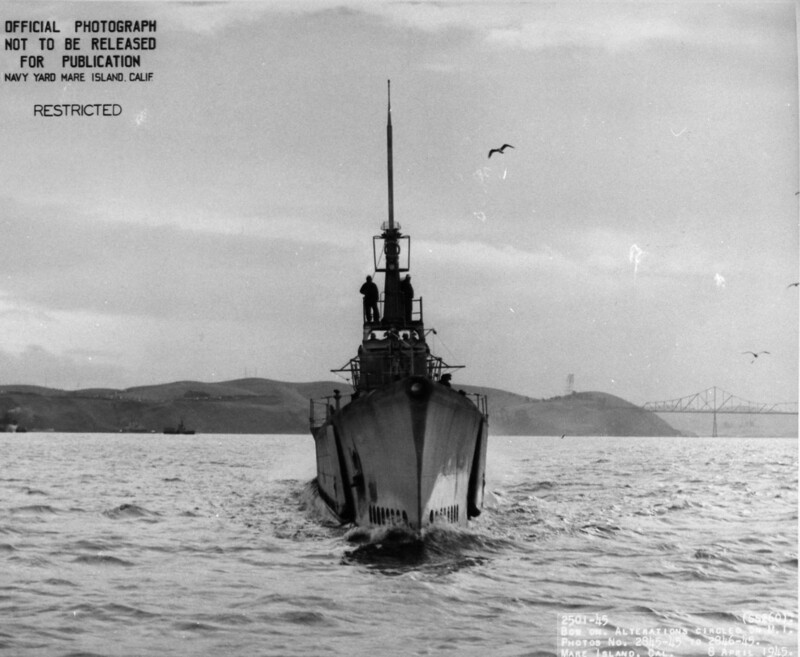 109k Bow on view of the Lapon (SS-260) departing Mare Island on 11 January 1944. The Howard W. Gilmore (AS-16) is to the left at her outfitting berth. USN photo 291-44, courtesy of Darryl L. Baker. 116k Lapon (SS-260) arriving home after another patrol, circa 1945. USN photo courtesy of ussubvetsofworldwarii.org. 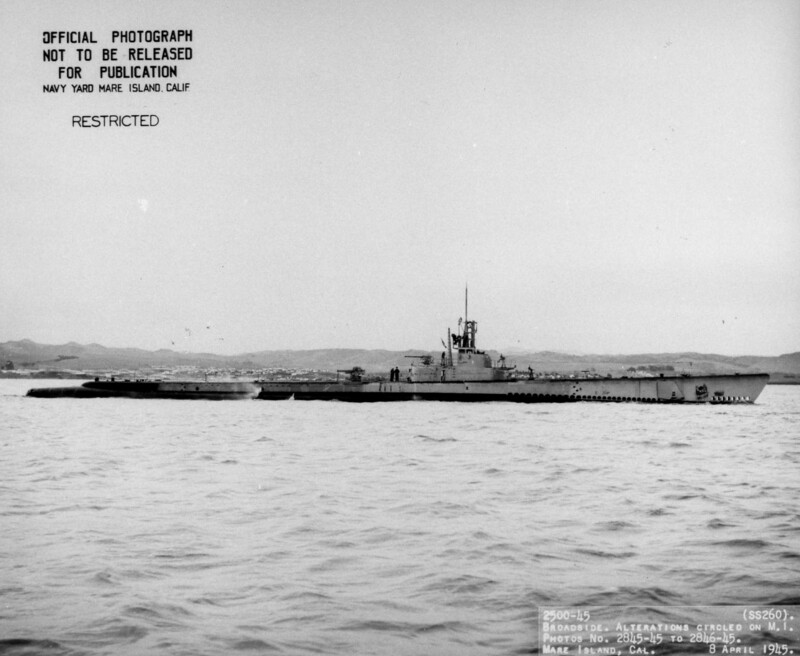 213k Broadside view of Lapon (SS-260) off Mare Island on 8 April 1945. She was in overhaul at the shipyard from 31 January until 22 April 1945. USN photo # 2500-45, courtesy of Darryl L. Baker. 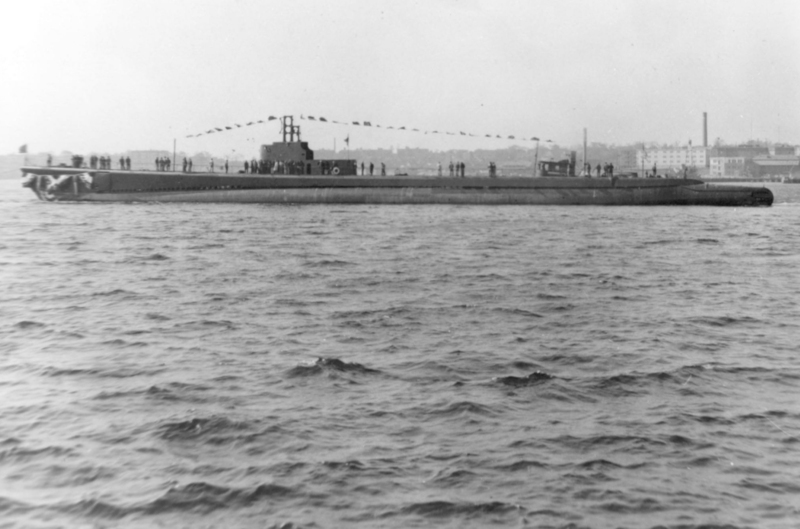 237k Bow on view of Lapon (SS-260) off Mare Island on 8 April 1945. USN photo # 2501-45, courtesy of Darryl L. Baker. 139k Radar revolutionized tactics. 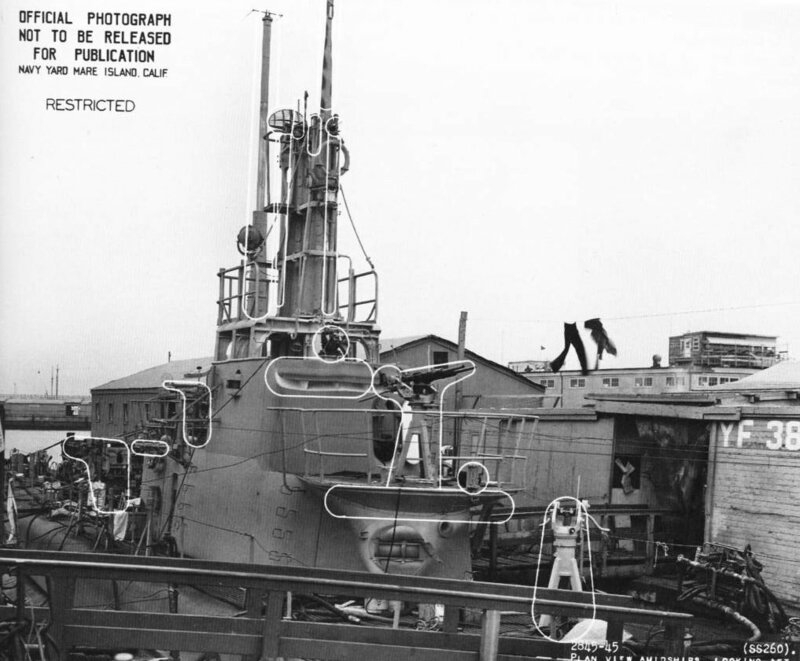 At Mare Island on 20 April 1945, Lapon (SS-260) shows the vertical antenna of her ST range-only radar (the strip under the window of her forward periscope). Her new radar mast, aft, shows an SD air warning antenna, soon to replaced by SV. Note the revised forward end of her bridge fairwater, with a single gun access trunk. U.S. Navy photo. Text courtesy of U.S. Submarines Through 1945, An Illustrated Design History by Norman Friedman. Naval Institute Press. 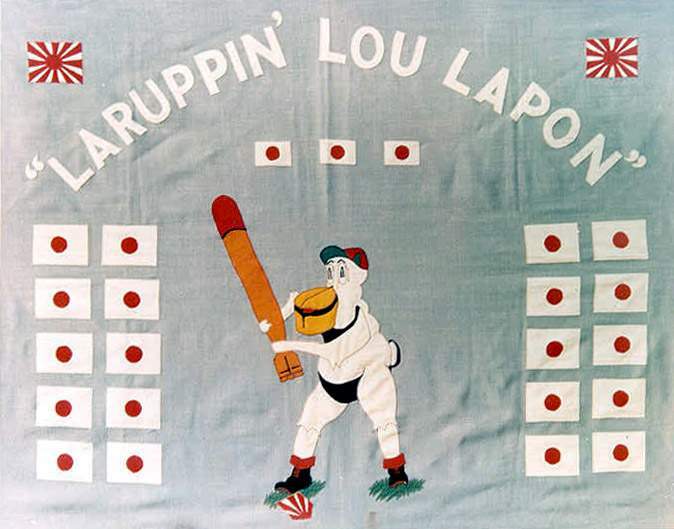 43k Battleflag of the Lapon (SS-260), 1945. USN photo courtesy of ussubvetsofworldwarii.org. 1.90k 16 page PDF of submarines named Lapon. Photos courtesy of Scott Koen & ussnewyork.com. Lapon (SS-260) and unidentified sub. Text courtesy of Dave Johnston. 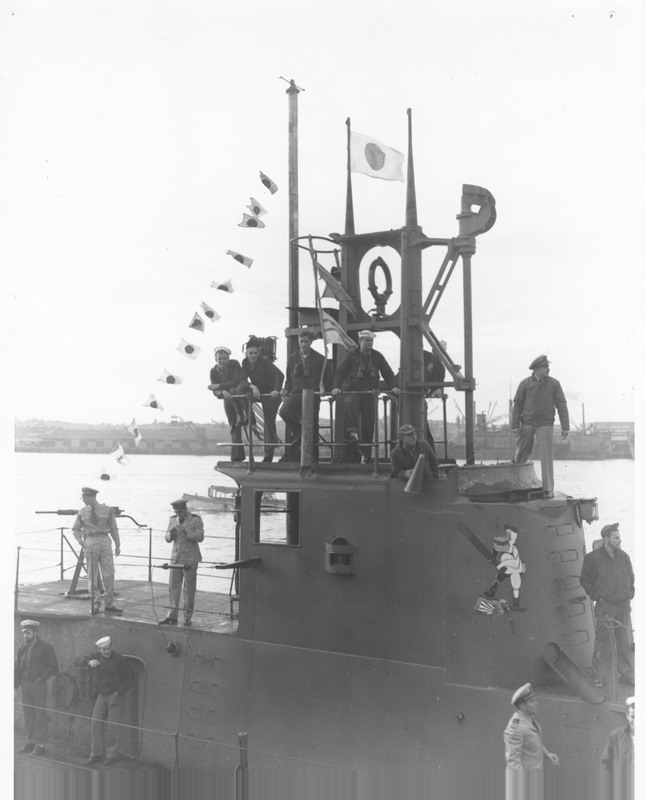 449k Groups of American sailors at the Portsmouth Navy Yard leisurely standing on the deck of two submarines, the Lapon (SS-260), and Billfish (SS-286), both flying Japanese Pennant String Flags, circa late 1940s. Photo by The Montifraulo Collection/Getty Images, courtesy of gettyimages.com. 862k Lapon (SS-260), probably when she was recommissioned at Kittery, ME, 13 April 1957. USN photo courtesy of ussubvetsofworldwarii.org. 743k Capt. Lowell Thornton Stone, USN WWII Commanding Officer of the Lapon (SS-260). Awarded the Navy Cross and two Silver Stars while CO. He is serving here as the Commander of SubPac Admin at Mare Island. 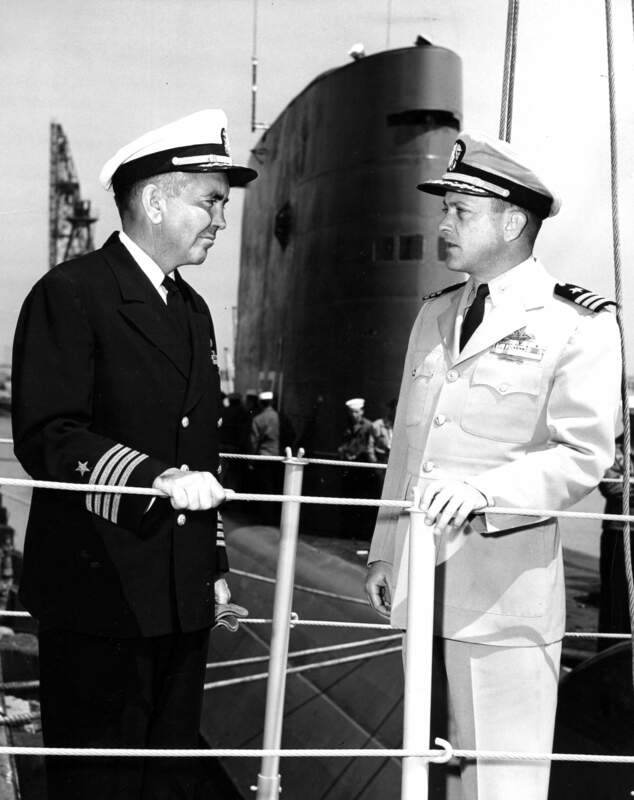 He is pictured with CDR William R. Anderson, Commanding Officer of Nautilus (SSN-571) on 20 May 1958 during the boats short visit to the shipyard. Photo from the files of the Vallejo Naval and Historical Museum via Darryl L. Baker. Photo courtesy of Tony Vrailas. 1.23k Poseidon (S-78), ex- Lapon (SS-260) in 1961. USN photo courtesy of ussubvetsofworldwarii.org. 507k Two views of Poseidon (S-78) in 1969. Official Royal Hellenic Navy photo, & insert (courtesy of Aldo Fraccarole) via Robert Hurst.